This morning I received a call from Mary, an 83 year old woman, who I have never met face to face and who lives in Parkville, Missouri. For roughly 45 minutes, we talked about our faith, Steve and my possible endeavors on the horizon, and a couple of stories from her life (for instance, she picked cotton in Mississippi as a girl). In today’s call, she mentioned that she was re-reading our Christmas letter and was so touched by the last paragraph, which Steve penned. Could she please use it as a message to share with others in her House of Prayer Ministry? Steve was quick to say yes, trusting my friendship with Mary. How is it that I’ve never had the pleasure of meeting Mary in person? She’s not on Facebook and doesn’t use a computer, so it isn’t as if we met through electronic media. Well, we met through a photo! In 2007 I took a photo of a cross and manger scene that graced the front yard of our Batavia friends, Bob and Lois. 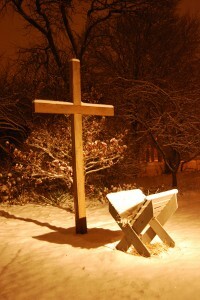 The December snowfall quietly came down that evening with streetlight and floodlight providing the “light” needed to bring the cross and manger its warm welcoming glow. I had been sitting at my desk on the second floor of our Batavia house, when I glanced out the window to be instantly wooed by the scene across the street. I grabbed my Nikon D-80, tripod, and remote, quickly donned my winter coat, and called Bob and Lois, “Could I please take some photos of your cross and manger scene?” I asked. From the resulting image, I ordered a 5X7 for them as a thank you for providing this beautiful scene. In fact, they enjoyed the photo so much that they asked to use it for their 2008 Christmas card. Then in October 2009, Mary, a friend of Bob and Lois’ who received their Christmas card in 2008 contacted them for my phone number. Mary wanted permission to use my photo for her Christmas card, which I granted and provided her with the digital file. She sent out the card along with a poem that she was inspired to write about the powerful image and dozens of people now have it. As the result of her initial call back in 2009, I’ve had numerous and lovely phone calls with her. In November 2011 she called me after an absence in contact of 18 months. Fortunately, she had my cell phone number as Steve and I had moved to Denver since our last conversation. Mary wanted to order an 8X10 and a 5X7 of the photo for her House of Prayer Ministry in Parkville. This is a ministry that she runs out of her former home on an acreage, which when rented years before sustained thousands of dollars of damage due to the tenants’ intentional vandalism before vacating. Despite her son’s initial reaction to tear the house down and start over, she and her family renovated it from the “ashes” (the tenants even went so far as to set the wood flooring on fire) and created a ministry. She found inspiration from God that she should do something special with the home. Thus, she began the House of Prayer, which provides a weekly program, a refuge for those out of work or for visiting missionaries, a library of inspirational books, and a special place for hospitality. I thank God for inspiring me to take the photo back in 2007, for Bob and Lois in sending a card to Mary, and the building friendship that I’ve enjoyed with Mary over the last two years. She is such an inspiration as well. I may just drive through Missouri on the way back from Steph and Shane’s wedding in March. I believe it is time to meet Mary!